Gotta stick to the canon. I bet the Stonebreaker will say “But the story really goes this way…” and try to change it to his favor. Ahhh I suspect that she cannot. Because a lot of pages ago the raven told Tenid, and that’s part of the story that Anyalin knows well, that in the demon world reality and memory are confused, and things are fluid. That apparently means that while Stonebreaker can try to cheat reality, memory cannot be violated, and if the memory is that Tenid broke his club, then that club cannot become unbroken. A loophole the Stonebreaker may try is to see if he can generate confusion and create false memories. Perhaps if something is forgotten or remembered incorrectly, that leaves room for him to alter time, or generate an alternate reality. 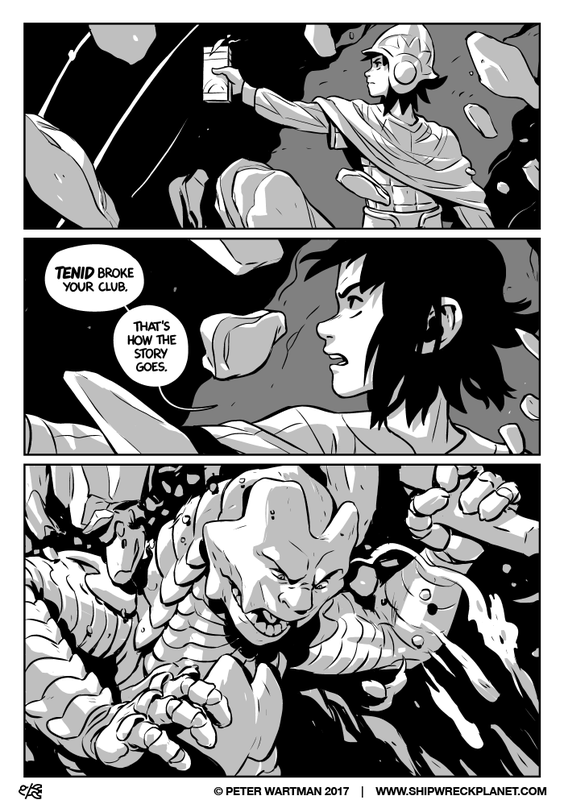 The point I implied in the previous comment is that Anyalin cannot just “keep going with all these changes” because her point in the middle panel is that Stonebreaker cannot change history either, and Anyalin is in the same position as Tenid, and has the same barrier stone, so the story cannot be changed arbitrarily. There will be! Just running a tad behind.